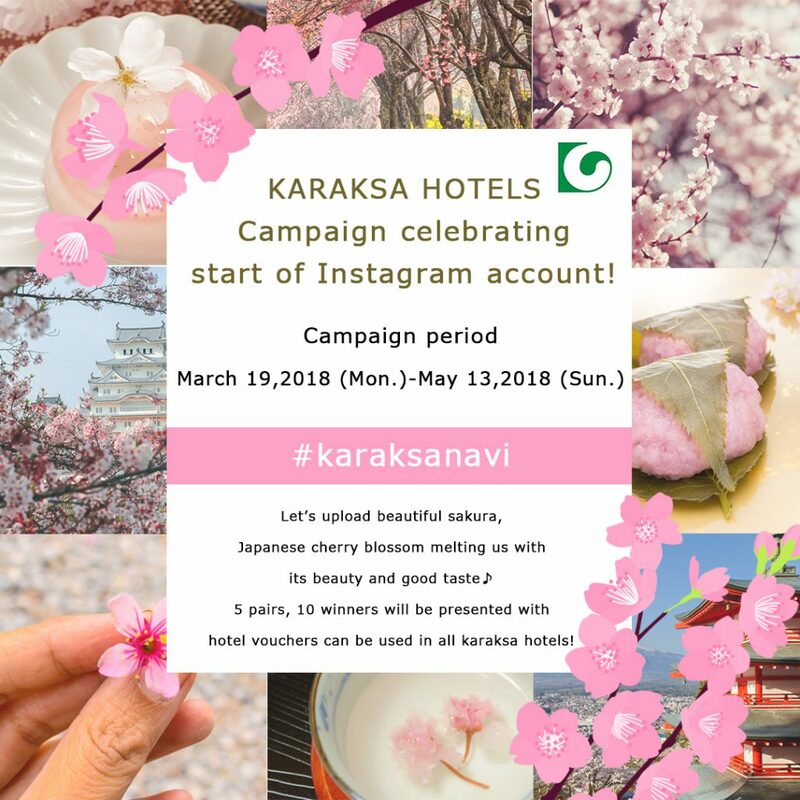 From March 19 to May 13, 2018, “karaksa hotel” official Instagram account is holding a photo campaign! Please post photos of cherry blossoms you find in Japan with #karaksanavi ! Any photos related to cherry blossoms in Japan would be fine – cherry blossoms in full bloom, food, beverages with cherry blossoms, etc, We will offer complimentary accommodation to five couples by lottery. Please note that we may share your photos on our official Instagram account, website, and/or Facebook page. *Sharing photos on our official Instagram account doesn’t mean the announcement of winners. Step 2: Post photos related to cherry blossoms, such as scenery, dishes or desserts with #karaksanavi on Instagram. Public account followers of our official Instagram account. If the photos posted infringe rights of a third party, we do not take any responsibility. If there are people in the photos, we would regard poster of the photos as already obtained the consent of people in the photos. Private accounts and posts without campaign hashtag could not be chosen. We would inform winners by Instagram direct message. The announcement of winners is scheduled around late May. This is the official account of “karaksa hotel.” The karaksa hotel are located in Sapporo, Osaka and Kyoto. We would share your nice photos of tourist spots, local products and souvenirs of the locations. Please post your photos with hashtag #karaksanavi, and we may share those on our official account!